Solanum viarum is a perennial subshrub or shrub that is in the potato family. It grows 3 to 6 feet in hight and has leaves shaped like Oak leaves, with clusters of tin white flowers. The sweet-smelling fruits are golf-ball sized, and are yellow when immature then green and veined when mature, looking like tiny watermelons. The fruits attract livestock and wildlife. The stems are armed with broad-based, downward-pointing or straight prickles. The tropical soda apple is an aggressive invader that can create monocultures for acres and have been observed to create them up to 50 acres wide in Florida. Another way it impacts ecosystems is the plant prickles can restrict wildlife grazing and create a physical barrier to animals, preventing movement through infested areas. Also, the tropical soda apple contains solasodine, which is poisonous to humans if consumed. This invader also serves as an alternate hose for pathogens such as the Gemini virus, cucumber mosaic virus, potato leaf roll virus, potato virus Y, tobacco etch virus, tobacco mosaic virus, tomato mottle virus, and the fungal pathogen Alternaria solani. Primarily this plant reproduces by seeds, it can occasionally reproduce from the roots or root crown. Seeds reach maturity just over 100 days but up to 50,000 can be produced per plant. Green stems stay present in mild winter temperatures and they may die off during the summer when in standing water. Flowers and fruits are present from September to May, with few fruits produced in the summer. Wildlife, primarily feral pigs, northern raccoons, and white-tailed deer, also eat tropical soda apple fruit and spread the seed through their feces. Also, the seeds can be spread by contaminated hay, sod or machinery. The first known collection of Solanum viarum in the U.S. was from Florida in 1988. It was found in Mississippi in 1993, in Georgia in 1994, in Alabama 1995, and on Puerto Rico in 1995. Because of its rapid population explosion in Florida and the concerns of livestock producers, Solanum viarum was placed on the Florida Noxious Weed List in 1994 and was placed on the Federal Noxious list in 1995. U.S. Habitat: It is typically found in soils that are poorly drained and sandy, but cannot survive extremely wet soils. Located in open semi-shaded areas such as pastures, ditch banks, roadsides, recreational areas, or agricultural fields like citrus groves and sugarcane fields. Resembles horsenettle (Solanum carolinense) which has smaller fruit and elliptic to ovate lobed leaves, and prickly yellow spines on stems and lower leaf veins but not on upper leaf. Also resembles, sticky nightshade (Solanum sisymbriifolium ), another introduced species, is similar in habit to tropical soda apple, but has more deeply cut leaves and the fruit is bright-red when ripe and is initially enclosed in a prickly husk. Several studies in Florida, have shown two biological control insects to help against the infestations of Solanum viarum; the leaf beetle Gratiana boliviana and the flower-bud weevil Anthonomus tenebrosus. 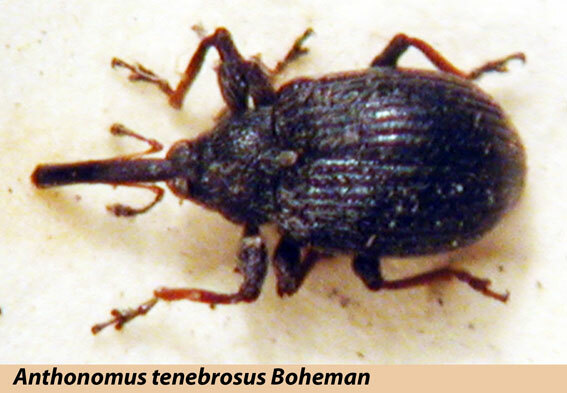 In 2003, the experiments with G. boliviana showed this beetle to be a successful control agent against tropical soda apple; however it is intolerant of cold weather and is ineffective in the northern mportion of Florida. Year later studies on A. tenebrosus occurred and we able to demonstrate the weevil’s high favoritizsm for tropical soda apple even when crops like bell peppers, eggplants and tomatoes were present. In conjunction these two beetle have shown promise in controlling Solanum viarum in Florida. Chemical controls can be effective for tropical soda apple. Triclopyr is very effective for control of emerged tropical soda apple when applied at 1 quart per acre or 1 to 1.5 percent solution with ¼ percent nonionic surfactant. However, if plants have been established long enough to release seed, the site should be frequently re-inspected and newly emerged seedlings treated. Since plants are heavily armed, hand removal is discouraged unless extreme caution is used. Plants can regenerate from roots, so complete removal can be difficult. To prevent tropical soda apple spread within a farm or community, steps should be taken to minimize seed production. Mowing is an effective practice to prevent seed production, even after flowering has started, although plant regrowth will occur and the practice should be repeated when plants start flowering again. Plants discovered with mature fruit should be cut, piled, and burned to destroy seed viability, or buried more than 3 feet deep. Akanda, Rais U.; Mullahey, J. Jeffrey; Dowler, Clyde C.; Shilling, Donn G. 1997. Influence of postemergence herbicides on tropical soda apple (Solanum viarum) and bahiagrass (Paspalum notatum). Weed Technology. 11(4): 656-661. Byrd, John D., Jr.; Bryson, Charles T.; Westbrooks, Randy G. 2004. Tropical soda apple (Solanum viarum Dunal) identification and control. Jackson, MS: Mississippi Department of Agriculture and Commerce, Bureau of Plant Industry. 2 p. In cooperation with: U.S. Department of Agriculture, Animal and Plant Health Inspection Service, Plant Pest Quarantine. Cuda, J. P.; Coile, N. C.; Gandolfo, D.; Medal, J. C.; Mullahey, J. J. 2004. Tropical soda apple. In: Coombs, Eric M.; Clark, Janet K.; Piper, Gary L.; Cofrancesco, Alfred F., Jr., eds. Biological control of invasive plants in the United States. Corvallis, OR: Oregon State University Press: 396-399. Medal, J., Bustamante, N., Bredow, E., Pedrosa, H., Overholt, W., Díaz, R., & Cuda, J. 2011. Host specificity of Anthonomus tenebrosus (Coleoptera: Curculionidae), a potential biological control agent of tropical soda apple (Solanaceae) in Florida. Florida Entomologist, 94(2), 214-225. Medal, J. C., and Cuda, J. P. 2010. Establishment and initial impact of the leaf-beetle Gratiana boliviana (Chrysomelidae), first biocontrol agent released against tropical soda apple in Florida. Florida Entomologist 93 (4):493-500. Sellers, Brent; Ferrell, Jay; Mullahey, J. Jeffrey; Hogue, Pat. 2009. Tropical soda apple: biology, ecology, and management of a noxious weed in Florida. SS-AGR-77. Gainesville, FL: University of Florida, Institute of Food and Agriculture Sciences; Florida Cooperative Extension Service, Department of Agronomy. Woodward, Susan L., and Joyce Ann. Quinn. 2011. Tropical Soda Apple. Encyclopedia of Invasive Species: From Africanized Honey Bees to Zebra Mussels. Santa Barbara, CA: Greenwood. 530-534. Print.